I'll be the first to admit I'm not in perfect shape; my expanding waistline is a pretty good indication of that, so fitness month came at just the right time. Now while I joined a gym I'm clueless when it comes to picking the right equipment, how long I should do it for, or if I'm even doing it right. While my co-worker suggested I take advantage of the gym's personal trainers my bank account says there's has to be a cheaper way to learning the basics or maintaining a balanced exercise regimen. 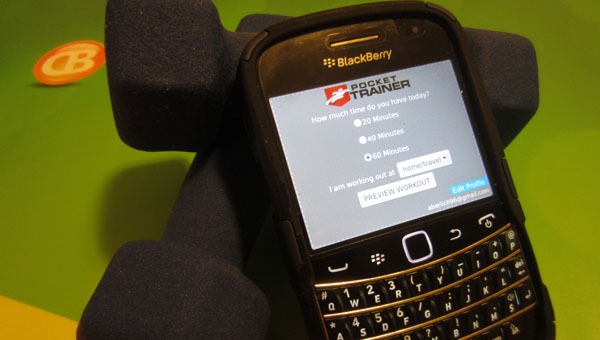 After scouring the health and fitness section of BlackBerry App World I think I found the answer I've been looking for in Pocket Trainer by Core Interaction, Inc.
Pocket Trainer takes the trainer out of the gym and places it into the palm of your hands so to speak. Designed by professional trainers, it tailors a fitness routine based on each individual user and not just spit out a random list of exercises that only a few can handle. All you need to do is input your height, weight, age, equipment you have access to, and what level of experience you are at (beginner, intermediate, and advanced) and it does the rest. It suggests a reasonable workout (which you can modify) based on your responses and what time you've allotted (20 minutes, 40 minutes, 60 minutes). 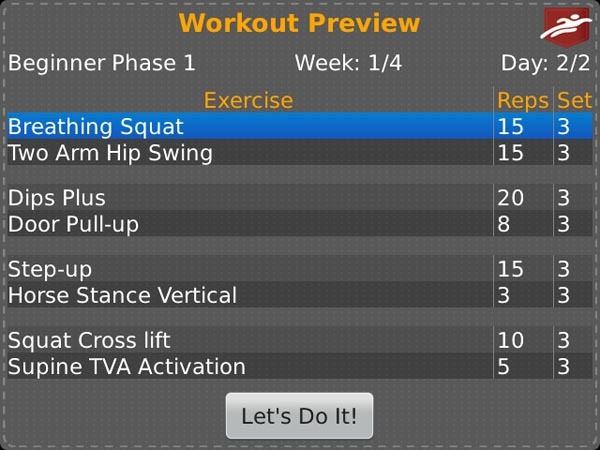 This application not only creates a customized workout but it also tracks your progress and adjusts your workout program accordingly. That's right, after 4-6 weeks it will update the difficulty so that your body doesn't get used to the routine. Their tutorials warn against getting stuck in the same workout over and over because adaptation stalls progress. Speaking of tutorials, comprehensive doesn't do it justice. It includes step-by-step instructions and high quality videos to make sure you perform each one correctly and offers alternative exercises if you are medically prohibited from doing, are experiencing pain, or you are unable to perform the exercise correctly. It tells you how many reps for each exercise is required and inserts rest periods between each one so you can recover from one exercise before starting the next. You may ask yourself: but what if I'm not at the gym? Pocket Trainer has you covered in that department. Right from the launch screen, you can modify your location which is great if you're at home or travelling without access to equipment. It quickly designs a new routine that can be done in your living room. 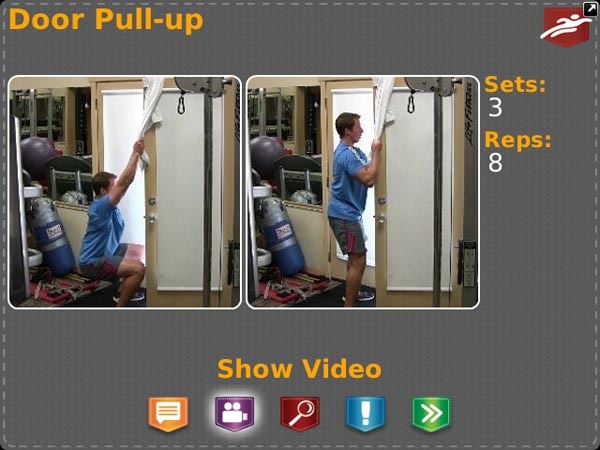 For example, the Door Pull-Up only requires a towel and an open door. I think this is fantastic; you don't have to spend a ton of money on equipment or on a gym membership. I normally don't exercise on the weekends because my gym is located next door to where I work. 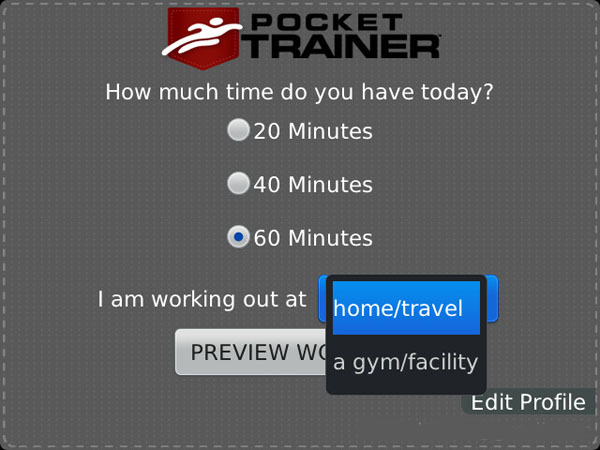 With Pocket Trainer I can fill up these empty hours without ever leaving my apartment. Its database contains over 300 exercises so you won't be bored with their routines any time soon. While the price tag is steep, I think this application is worth especially if you're just starting out. Many of the exercises suggested match those you'll see professional trainers demonstrate at the gym. You can grab Pocket Trainer for $12.99 in BlackBerry App World for devices running OS 4.5 and higher. They offer a free trial so you can test drive it for yourself. Pocket Trainer offers a comprehensive workout that focuses on key areas and muscles to help design the best possible and balanced routine. It adjusts to your schedule, offers amazing videos to help you along the way, and includes warm up and cool down times. Besides the cost, this application requires an internet connection to load videos and content. Buffering is sometimes a problem as is no signal in certain areas of the gym which will prevent you from loading your workout.